﻿ How to create bonus program with reward for purchase? How to create bonus program with reward for purchase? Bonus system. Get a reward for purchase. Let your customers know that you care about their happiness, add value that actually works. Free gifts or price benefits. How to create bonus program with a reward for purchase? Firstly check the introduction to Bonus program, how to set up basics. As we recommended here. In Settings/ Orders / Bonuses and rewards create new bonus program, add Title and specific settings. If you click on the SHOW IN THE CART button as active, bonus products are visible in your shopping cart. How does it look like in your shopping cart? If you activate SHOW AS A WEBPAGE new page is open, bonuses are visible on the separate page. How does it look like on your page? On the right bottom, click on the button CONTINUE. Again open the same bonus program. In the tab BONUSES add the gifts for your customers. Click on the New bonus. The products list is open with all store products inside. Choose products you would like to make for gift or products with special price and click on Add product to bonus program. Bonuses have no variants. So if the gift is a T-shirt or other item, name your gifts as T-shirt Nike S, T-shirt Nike M, T-shirt Nike L, and they can pick up the size. This is the way, how you can set up a special price for any product as a price benefit. In this case, you can set the final price for products (without VAT if you are VAT-registered). If you did not add a gift into your online store, please, do it in section products. Hidden- click on the eye for deactivation. In the case you need it, activate eye again. Create a new category for your bonuses. Add all your bonus products into this category. If you want to, there is a possibility to hide this category. The category does not show up in the menu bar, but you can manage all your bonus products from one place in your online store. You can choose more products. In your shopping cart is visible just 6 of them, in the specific order (based on bonus program settings). Your customer can see just the products which are assign to his rights. Which one? You can manage the bonus rights in tab SETTINGS of each bonus program section. In our case, every customer who purchase the product at least for £ 50 get T-shirt for free. If your customer has right for one or more bonuses without additional payment, you can activate feature "Put bonus into cart automatically". 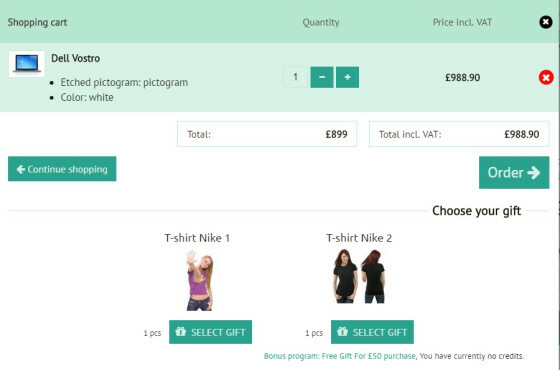 The gifts are added to the shopping cart of your customer, without a choice of selection. How does it look like in the shopping cart?